Gas tanker truck miraculously does not explode in latest salvo by Gaza terrorists, which caused several injuries. A rocket fired by terrorists in the Hamas enclave of Gaza hit a gas station in the coastal city of Ashdod on Friday morning, causing at least one serious injury. 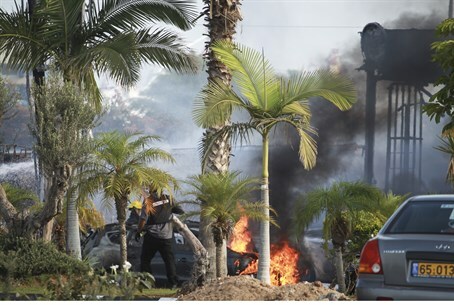 The rocket, which came as part of a salvo of roughly 20 rockets, damaged a gas tanker truck, reports Yedioth Aharonoth. The explosion reportedly set off a large fire at the station, which firefighting crews managed to control after a short time. Magen David Adom (MDA) medical teams treated and later evacuated a 50-year-old man at the gas station who was seriously injured by the rocket. At least two others were treated by medics for minor injuries, and roughly four others for panic. Miraculously, the damaged gas tanker truck which was carrying 35,000 liters of fuel did not explode despite the close proximity of the rocket blast which set it on fire. A short time later, Ashdod Mayor Dr. Yehiel Lasri told Channel 2 that "the man who was seriously injured at the gas station is out of danger," indicating that medics were able to stop the threat to the man's life. The IAF reportedly took out the rocket launching site from which the rocket on Ashdod was fired in an airstrike roughly an hour after the attack. Before the rocket hit, "Color Red" missile warning sirens were sounded in Ashdod, Rishon Letzion, Rehovot, Yavne and communities in the Gaza Belt region. Later on Friday morning, a rocket scored a direct hit on a home in the Eshkol Regional Council. Miraculously the family was unscathed after having taken shelter in their safe room. Gaza terrorists have continued to increase the rate of fire towards Israeli civilian population centers, with sirens being sounded as far north as Haifa on Thursday night, making it the first time since the 2006 Second Lebanon War. The terrorists have fired 407 mortars and rockets that struck Israel, with another 118 rockets being shot down by the Iron Dome anti-missile defense system since the start of Operation Protective Edge on Monday, an IDF spokesperson told AFP. Those rockets were joined by a rocket from a new front on Friday morning, as a Katyusha rocket was fired from Lebanon on the upper Galilee in Israel's far north. The IDF returned artillery fire on the source of the fire. The IDF reportedly is intending to imminently launch a ground offensive on Gaza, after warning 100,000 Gaza residents to evacuate the security border area on Thursday. IDF officials said a ground assault has been rendered practically inevitable due to Hamas's extensive use of human shields, placing civilians on the homes of terrorists that are targeted so as to inflate the death toll and deter airstrikes.